We look at the opportunities and concerns in the display market surrounding HDR as well as the potential of OLED technology. Previously, we took an overview of the current state of screen technology and considered where display technology is heading. Here Ian McMurray looks at the opportunities and concerns surrounding HDR as well as the potential of OLED technology. It could be said that, for now at least, discussion of pixels is no longer about quantity, but quality. A technology that is emerging that has the potential to redefine image quality is OLED. 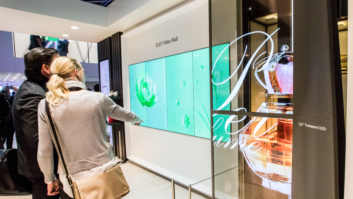 The key word here is ‘potential’: the industry is not convinced that it is yet ready for the rigours of commercial installations – and HDR delivers many of the image quality advantages of OLED. Walter, notes that, while OLED may not yet be ready for commercial installations, it is “a technology that NEC is following intensely”. It should be said, however, that the pro-AV industry is widely appreciative of the incredible images of which the technology is capable and believes that OLED has a brighter future near term in the consumer market than the commercial. And, of course, any discussion of OLED would be incomplete without referring to its light, thin nature which can not only make mounting a display as simple as taping it to a wall, but also makes it possible to create ‘rollable’ screens. It seems inevitable that, eventually, these characteristics will create new display applications – but, at least in the pro-AV field, it’s far from clear yet what those might be. It becomes apparent, then, that in terms of resolution, brightness and contrast – the primary contributors to image quality – we have as much as we need today. Certainly, efforts to improve it will continue: “The most successful display manufacturers in the next five years will be those who prioritise image quality and the viewing experience,” believes Steve Scorse, vice president, EMEA at SiliconCore – but the thrust of display development may well lie elsewhere. Winck believes we will see truly bezel-less displays within a few years, and points out the enormous strides that have been made possible by IP in terms network connectivity and controllability. Installability is a recurring theme. As straightforward as displays may be to deploy, there is still room for improvement. It’s not just in the perhaps arcane world of outside broadcasting that installability is important.